Over the past few months I've been hitting the books hard at LIM College, attending class full time and earning my MBA in Fashion Entrepreneurship. It's been a great experience and is helping me launch a new clothing line (more on that really soon). I've also moved into a gorgeous new apartment with my boyfriend, and we've been buying and building furniture, and decorating up a storm. We share a board on Pinterest where we've both been pinning things we would like for our new nest. We both liked the idea of a picture wall, and with our bedroom walls completely empty, I snagged some supplies to make our own. First I measured my headboard, which was 5 feet wide. 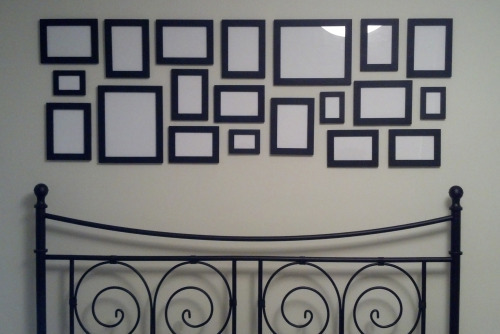 I put the tape measure on the counter so I could lay out my frames and move them around until I liked the configuration. If you don't have a tape measure, go ahead and measure with string, then lay the string on the counter or floor to do your layout. 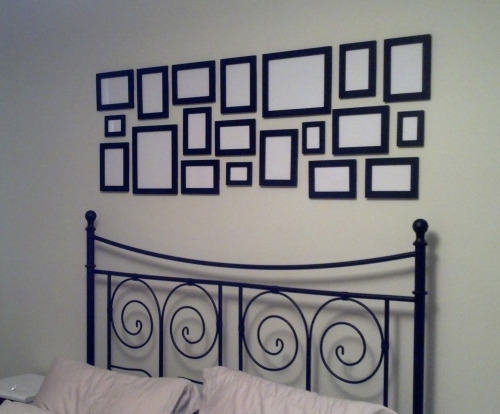 Once I liked what I saw, I put Command picture hanging strips on the backs of all of the frames. (I did a test on our walls-- they did come off just as easily as they say they do). These are great because they aren't permanent and if you goof you can peel them off and move your frame. 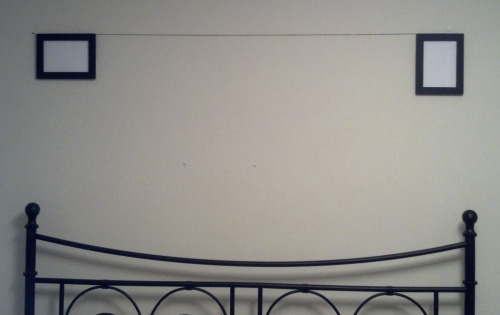 Next I taped the string on the wall above our headboard, to act as a guideline for mounting all the frames. I used my level app to make sure the string was level. 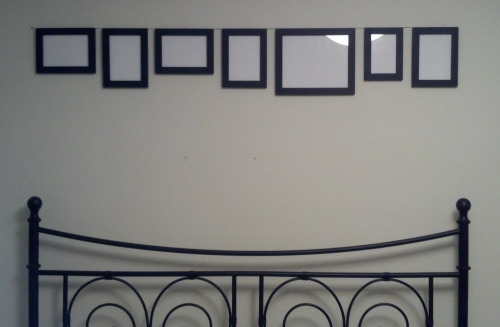 I put up the two top corner frames first, then filled in the top line, then worked my way down. I had to re-do a couple, so it was good I had a few extra strips. I love the way it turned out. Can't wait to get photos printed!